When ordering a 3D printed model from embodi3D's 3D Printing Service it's important to consider the material used to print your model. We offer a variety of 3D printing materials and processes to best meet your needs. The best material will vary depending on the size, anatomy, and intended purpose of your model. Not all materials are available on all models due to size constraints. Durable plastic that is best for large bone or general 3D prints. We use white polylactic acid (PLA) and an FDM printing process. Strong white plastic is the best choice for larger parts that require fine, but not very fine detail. Models are very strong and resistant to breakage. PLA is a safe, nontoxic, biodegradable material commonly used for 3D printing. Same material as Strong White Plastic above. Printed at 50% size of the full model dimensions. Durable plastic that is best for cardiovascular or general 3D prints. It is identical to strong white plastic except for the red color. We use polylactic acid (PLA) and an FDM printing process. Strong red plastic is the best choice for parts that require fine, but not very fine detail. Models are very strong and resistant to breakage. PLA is a safe, nontoxic, biodegradable material commonly used for 3D printing. 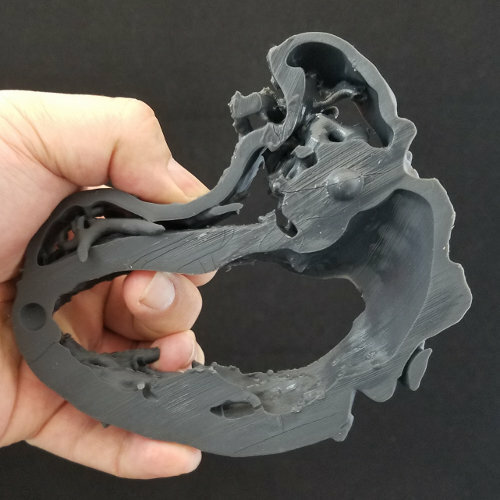 Durable plastic that is best for cardiovascular or general 3D prints. It is identical to strong white plastic except for the blue color. We use polylactic acid (PLA) and an FDM printing process. Strong blue plastic is the best choice for parts that require fine, but not very fine detail. Models are very strong and resistant to breakage. PLA is a safe, nontoxic, biodegradable material commonly used for 3D printing. Durable plastic that is best for large bone, skin or general 3D prints. We use beige polylactic acid (PLA) and an FDM printing process. Strong beige plastic is the best choice for larger parts that require fine, but not very fine detail. Models are very strong and resistant to breakage. PLA is a safe, nontoxic, biodegradable material commonly used for 3D printing. Durable plastic that is best for large bone, skin or general 3D prints. We use brown polylactic acid (PLA) and an FDM printing process. Strong brown plastic is the best choice for larger parts that require fine, but not very fine detail. Models are very strong and resistant to breakage. PLA is a safe, nontoxic, biodegradable material commonly used for 3D printing. Durable plastic that is best for large bone, skin or general 3D prints. We use silver polylactic acid (PLA) and an FDM printing process. Strong silver plastic is the best choice for larger parts that require fine, but not very fine detail. Models are very strong and resistant to breakage. PLA is a safe, nontoxic, biodegradable material commonly used for 3D printing. Durable plastic that is best for cardiovascular, bone or general 3D prints. Choose any two Strong Plastic choices and we will print your model with parts of different colors. Specify colors and corresponding parts in order instructions. We use polylactic acid (PLA) and an FDM printing process. Strong plastic is the best choice for parts that require fine, but not very fine detail. Models are very strong and resistant to breakage. PLA is a safe, nontoxic, biodegradable material commonly used for 3D printing. Detailed white plastic that is great for small to moderate sized dental or highly detailed bone prints. We use UV cured resin using a stereolithography printing process. Detailed white plastic is the best choice for parts that require very fine detail. Models may break if dropped or subjected to impact. Detailed, translucent, hard plastic. Good for smaller, high-detail models. We use UV cured resin using a stereolithography printing process. Detailed plastic is the best choice for parts that require very fine detail. Models may break if dropped or subjected to impact. Same as detailed frosted above, but specially treated and polished to a transparent, glassy finish. A soft material that simulates rubber, this material creates soft, elastic, and flexible part. Good for small parts that need flexibility. More flexibility than our Flexible material.